Astronomers have discovered the most distant galaxy yet — a celestial object whose light took an astounding 13.1 billion years to get here. It’s less than 2% the mass of the Milky Way, but it’s producing stars at a rate that’s confounding scientists. Top image: An artistic impression of z8_GND_5296, a primordial galaxy located over 30 billion light-years away. The galaxy, called z8_GND_5296, was discovered by an international team of astronomers using the Hubble Space Telescope. Its distance was subsequently confirmed with the ground-based Keck Observatory in Hawaii. To confirm its distance, which is now at a jaw-dropping 30 billion light-years away, astronomers took a look at its redshift value — a wavelength signature indicating the rate at which light-emitting objects are moving away from us. The redder the object, the further away it actually is. And yes, it's 30 billion light-years away, even though it's 13.1 billion years old. Remember, the universe is rapidly expanding, so it's moving away from us. We're only now catching a glimpse of what it looked like 13 billion years ago. The estimated size of the observable universe is about 45.7 billion light years. Prior to the discovery of z8_GND_5296, the deepest redshift was recorded at 7.21. But this little galaxy has a redshift value of 7.51, which means it’s 40 million years older than the previous record holder. The team that discovered it say it's the most distant galaxy ever discovered. The color of z8_GND_5296 galaxy suggests it was rich in metals. It has a mass of one billion suns, which is 40 to 50 billion times less than the Milky Way. Strangely, observations show that the galaxy has a freakishly high star-formation rate of about 330 solar masses per year. That’s about 100 times greater than what’s seen in the Milky Way. 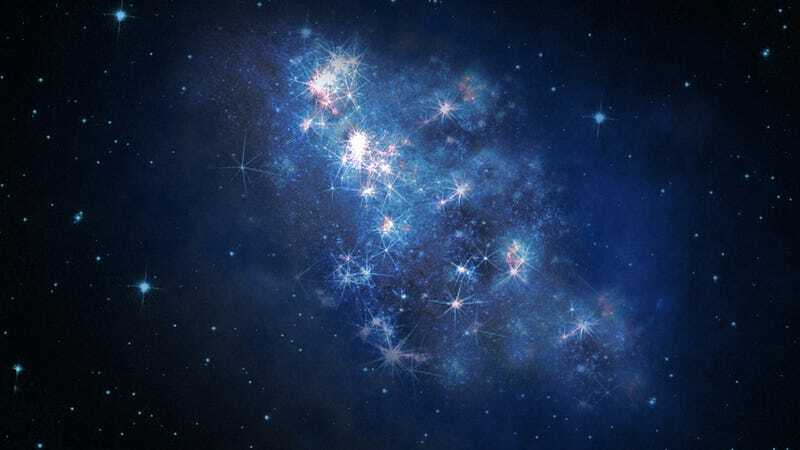 The galaxy started churning new stars a mere 700 million years after the Big Bang. “Such a galaxy is unexpected in a survey of our size,” write the authors in the study, “suggesting that the early Universe may harbour a larger number of intense sites of star formation than expected.” Prior to this discovery, astronomers didn’t think such intense star-formation could exist in the early universe. Star formation tends to be proportionate to a galaxy’s mass. And early galaxies tend to be small. One possible explanation is that z8_GND_5296 contains more gas than expected, which it uses to spawn stars. Alternately, it could be sucking up excess gas at rapid rates in the space between galaxies. All images: V. Tilvi, S.L. Finkelstein, C. Papovich, NASA, ESA, A. Aloisi, The Hubble Heritage, HST, STScI, and AURA.